Pinay WAHM: I "Heart" My M-O-M...a Tag! I "Heart" My M-O-M...a Tag! So you thought Mother's day entries are done? Think again! Hahaha....I was tagged by Arlene of Dancing in Midlife Tune to do yet another tag on my dear Nanay. Thanks, Arlene. 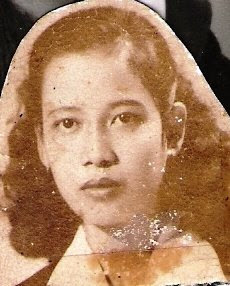 I chose not to post anything about my mother for mother's day because she passed in 2000. It's not that I don't think of her on Mother's Day anymore. It's actually hard to write about her as I miss her terribly. All you need to do is post a picture of you and your mom (old or new) and caption it with your photo editor with the words "i heart my mom." Then tag your friends. We didn't grow up around cameras so we don't have many pictures of my parents. But both of them had pictures when they were much younger especially my father. This first picture is her college picture and I've had it since I can't remember when. It has always bee in my wallet eversince I found it. The second picture is THE ONLY picture we have together. This was taken in Februay of 1997 and she was about 67 years old. 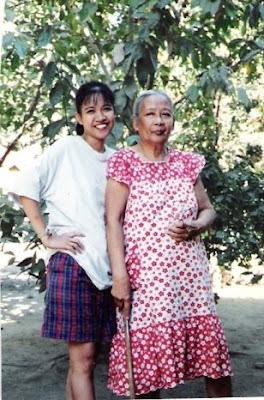 Like I mentioned in my entry during her 8th year Death Anniversary, my Nanay was a full-time mother. I never really thought we had so much in common until after she passed. At certain points in our lives, we did things "EXACTLY" the same way. It's kind of 'creepy' actually to think how I ended up doing what she did. One of these days, I'd probably write about those things. There 'ya go. I won't be tagging anyone in particular. If you want to grab this, feel free to do so. You look exactly the same ng mother mo Jul. juliana, she's lovely! sad to know she went ahead but it's better at least rested na sya from the pressures in life. thank you so much for playing along!